RecipeSavants.com This sandwich is rich with the full flavors of roast beef and spicy vegetable giardiniera. This is a classic recipe from Chicago that will remind you of the windy city. For even more decadence melt some savory and smoky provolone cheese over the saucy beef. Pair this sandwich with a savory potato salad or coleslaw. Smart Recipes, American Recipes, Beef Recipes, Recipes Beef American Best Italian Beef Sandwich PT1H50M Serves 4 Ingredients: 3 Pounds Boneless Rump Roast 1 Tablespoon Kosher Salt 1.5 Teaspoons Onion Powder 1 Tablespoon Dried Oregano 1 Teaspoon Smoked Paprika 4 Cloves Garlic 2 Tablespoons Extra-Virgin Olive Oil 2 Cups Beef Stock 4 Soft Italian-Style Hoagie Rolls 1 Cup Spicy Celery Giardiniera 0.25 Pound Smoked Provolone Cheese Pat the roast dry with paper towels. In a small bowl, combine the oil, minced garlic, oregano, onion powder, paprika, and salt & black pepper and mix until a smooth paste is formed. Season the roast evenly. Marinate in the refrigerator for 4 hours, or overnight. Remove the roast from the refrigerator, and allow to rest at room temperature for at least 2 hours. Preheat the oven to 450 degrees. Bake the roast in the preheated oven for 30 minutes, and then lower the temperature to 325 degrees for 1 hour. Remove the roast to a clean cutting board and tent with aluminum foil and rest for 30 minutes, and carve into thin slices. Meanwhile, heat the roasting pan over medium-low heat, and stir in the beef stock making sure to scrape up any brown bits. Bring to a simmer, and stir in the sliced beef. Meanwhile, slice each roll in half lengthwise, and dunk in the au jus. 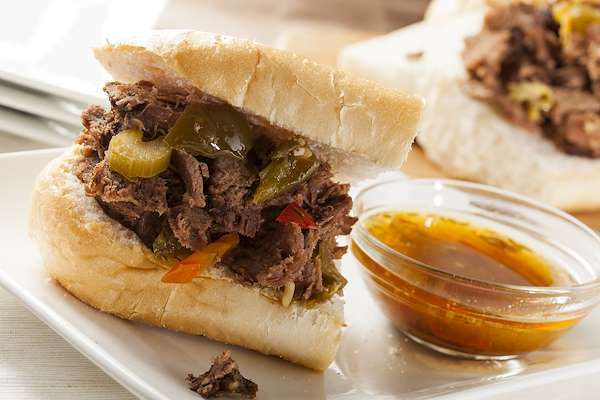 To assemble the sandwich, pile a mound of beef on each hoagie roll and top giardiniera and a slice of provolone cheese.